What is the best gift anytime? 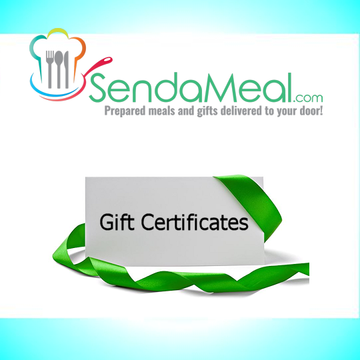 A Send a Meal Gift Certificate. Select any dollar amount. That amount can be used towards any products located on SendaMeal.com. Your gift recipient will be able order our prime rib dinner, live lobster meals, a combination dinner, and so much more! You may enter your gift card message at checkout. Shipping Information:Orders received on any weekends(Saturday/Sunday) will be emailed or mailed the following Monday. Specific delivery dates cannot be guaranteed if sent by US Mail. Please type a requested Delivery Date in the box below. We can deliver a hard-copy with fast next business day delivery. Just select the FedEx delivery option below. There will be an additional $45.95 charge for Next Day Air or $54.95 for Saturday delivery. Gift certificates expire one year from the date of issuance at which time a new certificate code maybe issued to the named recipient and a 20% service fee will be applied. Service fee policy applies to all subsequent issued codes and all codes hold no value after five years. *Same day delivery only applies to email delivery of voucher. *Gift certificates may not be redeemed for cash.